RSS Infrastructure Ltd (RSSI), winner of the Rail Partnership Awards ‘SME of The Year’ and Birmingham Post Business Awards ‘Professional Services’ award, have once again demonstrated their place as an infrastructure leader by rolling out the companies first all-electric vehicle. The Nissan e-NV200 is a zero emissions all-electric commercial vehicle that will play a vital role in operations for all of the company’s departments. Equipped with a 40kWh battery, the van will serve as an essential delivery vehicle to and from their new Birmingham HQ, which saw Auctus Management Group Ltd and all subsidiary businesses relocate to the new premises on Monday 17th December inside the Gee Business Centre, Holborn Hill, Aston, B7 5JR. The company aims to increase its fleet of hybrid/full electric vehicles from its current 9%, to 35% by 2020. The new headquarters have not only provided space for the company to grow, but they will also accommodate their plans for innovation. 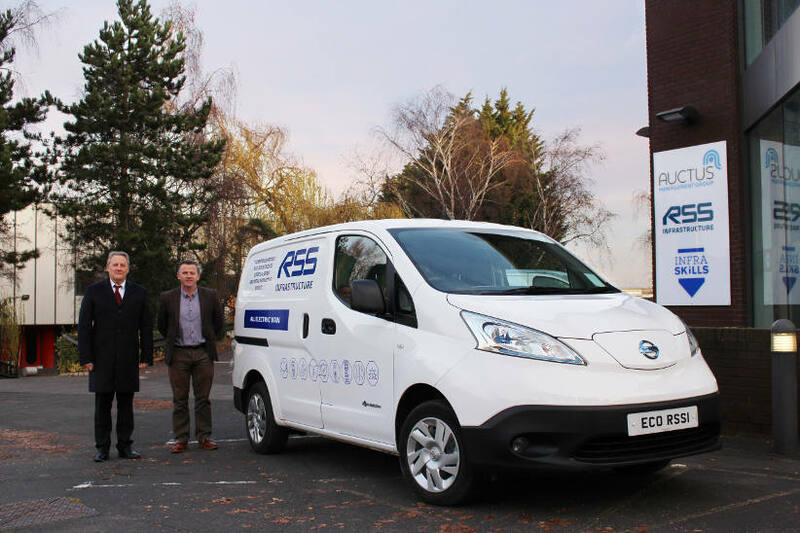 Sean Harrison and Pete Thompson, Directors of RSSI are particularly proud of the new charging bays, located to the side of the building, that will play an integral part in keeping the e-NV200 and 7 hybrid vehicles charged and ready for business.